Regardless if you plan to utilize the coworking concept or childcare convenience of Lodgic, you now have two new dining options on South Neil Street in Champaign. 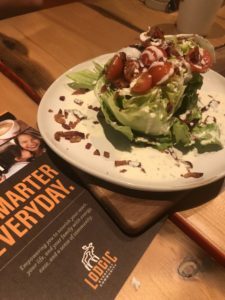 While the coworking spaces and Kids Camp require membership or fees of some sort, the Clever Moose Market Cafe and Everyday Kitchen Restaurant and Bar are open to the public just like any other dining establishment you would drop in on. 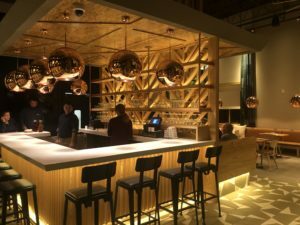 My family and I enjoyed dinner at Everyday Kitchen, which is open for lunch, dinner and drinks seven days a week. My husband and I and our two children decided to try a little bit of everything on the menu. We did notice right away that there wasn’t a separate kids’ menu for Everyday Kitchen. 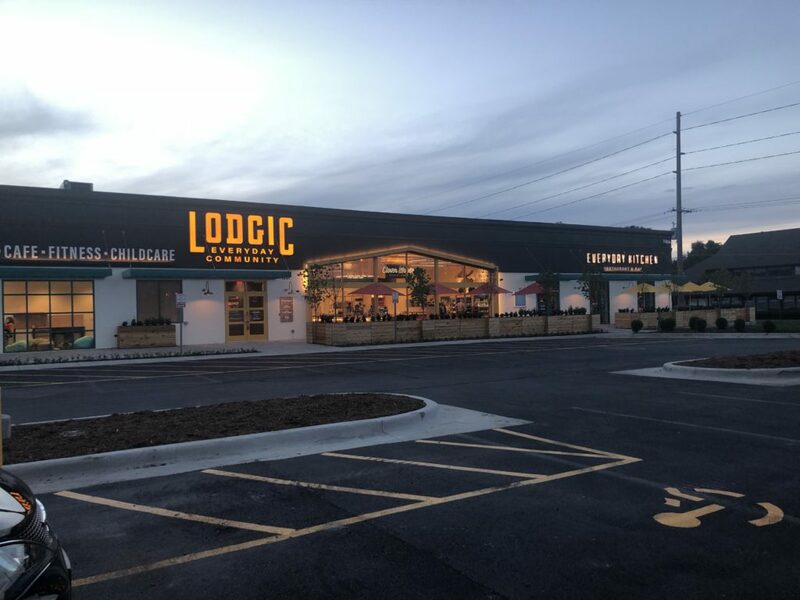 Lodgic describes the restaurant on its website as “an upscale spitfire grill great for business lunches, hearty meals, cocktails, and date nights.” So while children are certainly welcome (and enjoy the atmosphere of the restaurant), you won’t find a menu just for them. They were given a Lodgic notebook bundled with crayons when they sat down, though. Everyday Kitchen prices seem to be competitively in line with Downtown Champaign dining establishments catering to a similar audience. The half-pound Everyday Burger and fries comes in at $14 and a 10-ounce New York Strip steak (with two sides) costs $25. We decided that we would get an order of chicken crunchers (an appetizer) and a side of mac ‘n cheese for our 7-year-old and 4-year-old, so even though there wasn’t a kids’ menu, it was easy to find things for them to eat. The staff was very friendly and well-trained. 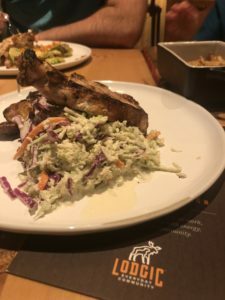 We didn’t have to wait long for our orders to be taken or our food to be prepared, and I really enjoyed that the restaurant is set up in such a way that it seemed like we had our own little nook of the restaurant for our family. Our daughter even called our meal “good family time” since really, it felt like just us there. Some favorite dishes we tried were the wedge salad and bone-in pork chop. The name “Everyday Kitchen” is really spot-on with this place as you can expect well-prepared restaurant staples when you dine here. 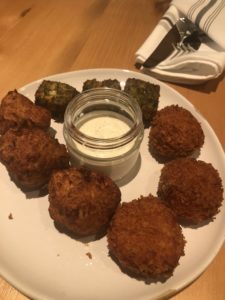 They add their own “flair” to certain dishes (like the trio of tots sampler we had as an appetizer) but most of their menu is designed to appeal to a very broad audience. 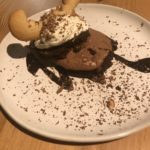 Even though it was way past bedtime at this point, our server told us we had to try the signature “Chocolate Moose” dessert before we left. As Lodgic’s profits benefit Mooseheart and you’ll see The Moose theme clearly throughout the entire building, it only makes sense there would be a moose-shaped dessert on the menu. This might have been the kids’ favorite part of our meal. While on site, we took a peak at the rest of the Lodgic space before ducking out for the night. 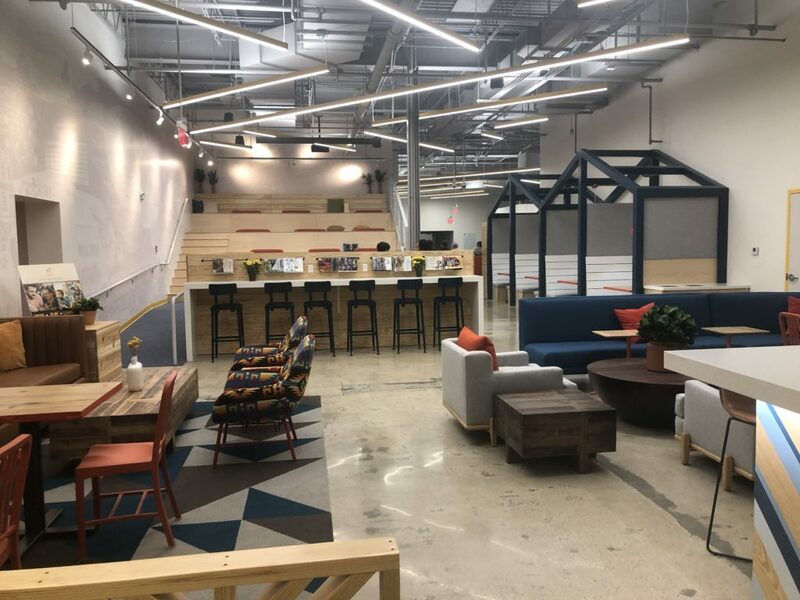 When you first walk into Lodgic, you are standing in the Clever Moose Market Cafe before venturing into the coworking space, Kids Camp or the restaurant. This area is open to the public and has Wi-Fi available. If you decide to upgrade and move into workplace, they offer half-day and full-day passes for you to try it out. Then we headed over to Kids Camp, ready to accept and accommodate all kinds of family situations, from drop off Kids Camp to a kid-friendly workspace to nursing mothers’ rooms, too. 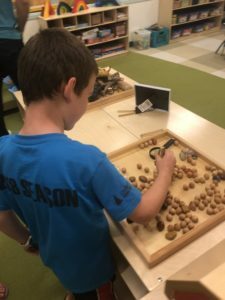 Our kids explored the age-appropriate space for them and especially enjoyed the way different activities were set up around the room. 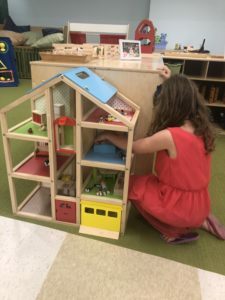 Lodgic differs from traditional drop-in childcare in that it has a designate “play and learn curriculum” to structure the classrooms, so that kids are learning and experiencing new things instead of simply being babysat while their parents work. Director Cherie Mondrella tells us the curriculum is based on Montessori and Reggio Emilia approaches to education.